HTC is offering the standard set of peripherals with the Butterfly 2. You get a microUSB cable, a standalone A/C adapter (rated at 1.5A) and headphones with a remote and mic. The HTC Butterfly 2 is a big phone - truth be told, a little bigger than most 5-inchers but a pair of stereo speakers, water protection and a second camera at the back are a better excuse than most. It's almost exactly the same size as the One (E8) at 145.4 x 70.2 x 10mm. The weight has been slightly reduced to 151g, compared to the all-metal HTC One (M8). The HTC Butterfly 2 has the unmistakable shape of the company's flagship, curved at the right places, the flat front with stereo speaker grilles - inevitably missing some of its character: glossy plastic is no match for one of the hottest bodies in business. The Dual Camera set up at the back is also typical HTC lately but thankfully not a 4MP ultra-pixel unit. It's the better-performing 13MP sensor we saw in the HTC One E8 and the Desire 816. 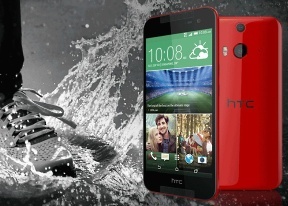 The HTC Butterfly 2 comes in three colors, two of which with glossy finish - Blue and Red. The White paint job is matte. While still a well-designed smartphone, the HTC Butterfly 2 lacks that special something the One (M8) and its predecessor have. The outlines of the body are virtually the same and all the buttons are where you'd expect them to be but the glossy plastic material doesn't look or feel nearly as nice in hand. The sloping rear with curved corners allow for a comfortable in-hand feel and, in spite of the sheer girth of the Butterfly 2, it is perfectly manageable. At 151g the device has a good heft to it and the plastic back isn't as slippery as the brushed metal used in the One (M8). We wish HTC had gone for a completely matte finish for the Butterfly 2 so that it would provide better grip, look more sophisticated and feel better to. By just looking at the HTC Butterfly 2 you wouldn't know it was an IP-certified device. It has no protective flaps and covers on its headphone jack or microUSB port, which is welcome. It means that you'd need to wait before charging the phone after a dip but the alternative is having to undo a flap each time you want to charge the phone. The front of the Butterfly 2 follows the standard HTC layout. You get two BoomSound speakers, top and bottom of the screen, each with its own driver. The 5MP wide-angle f/2.0 front-facing camera is in the top right corner and there are an ambient light and a proximity sensor. The navigation buttons are built-into the display so the front is left completely button-less. The right side offers two separate volume keys with a brushed finish and a nano SIM card slot. On the left side there's only a microSD card slot locked in a compartment of its own. The HTC Butterfly 2 can carry SD cards of up to 128GB. The top of the HTC Butterfly 2 welcomes back the IR port, which the E8 omitted, and a power button, which is very hard to reach on this five-incher. HTC offers motion launch so you'd rarely need the power button at all. On the bottom lies the main microphone, the 3.5mm headphones jack and a microUSB 2.0 port. MHL is another plus on the spec sheet compared to the One E8. The back looks similar to the HTC One (M8)'s, save for the higher resolution main camera. There's a two-toned (amber and yellow) LED flash, a 13MP main camera and a depth-measuring second camera above it. Featurwise, the HTC Butterfly 2 seems to get the best of the two words that are the One (M8) and the One (E8) - it has the IR port from the M8 and the 13MP snapper from the E8. There's even a bit of exclusivity thanks to the water and dust resistance, you're looking at a nice blend between the two flagships with a feature that puts it in a special company.